Quick breads are so much easier! We don't eat a ton of sweets here, but we really enjoy blueberry muffins when fresh, local blueberries are plentiful at the farmer's market and the food co-op. I've worked out a new recipe since getting my Mockmill, using 100% fresh-milled White Sonora wheat berries. Have ingredients at room temp, butter a little cooler if your room temp is very warm. Mix flour, baking powder, baking soda, and salt. Add the vanilla extract to the whey. Cream butter and sugar well; add eggs one at a time, beating well after each addition. Add dry ingredients and beat well. Then add whey and vanilla extract, mixing just until smooth. Gently fold in blueberries. Fill muffin cups 3/4 to almost completely full. Bake at 375F for 25-30 minutes, until tops are browning and a toothpick comes out mostly clean (unless it hits a blueberry). Cool in the tin on a rack for 10 minutes, then remove from the tin and cool for an additional 10 minutes before eating. We think these taste great. 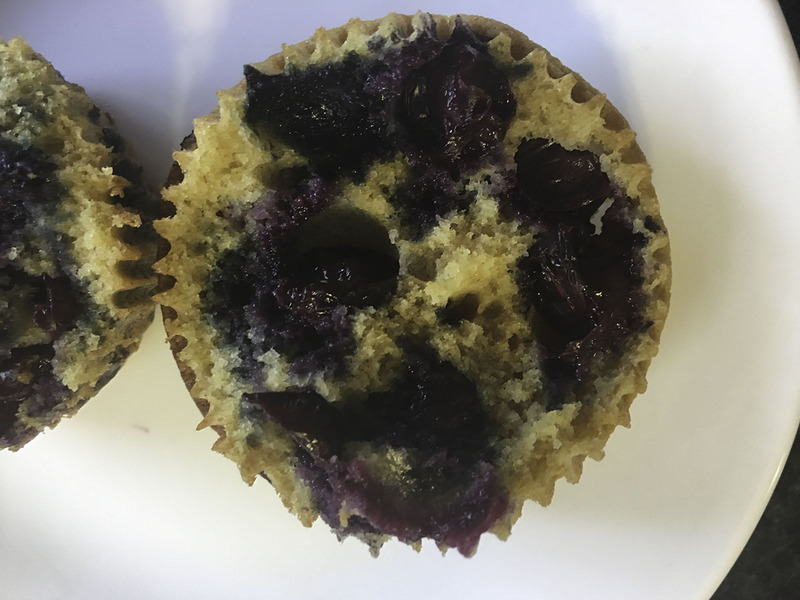 This is an adaptation of a recipe from the King Arthur website (https://www.kingarthurflour.com/recipes/our-favorite-blueberry-muffins-recipe), but I've changed it pretty substantially. If you don't have whey, buttermilk or yogurt would probably work, although the crumb might not be quite as light and fluffy. If you would rather use milk, eliminate the baking soda and increase the baking powder to 2 tsp. (6 g) and the salt to 1/2 tsp. (3 g). because I don't eat these kind of muffins! Very nice for sure. Well done and happy baking Fran! ... even though I've cut the sugar in the original recipe by 15% at this point (and left off the cinnamon sugar topping, too). I'm thinking of cutting back another 5% (7 g) next time I bake them. I think it'll still work. Only one way to find out. Not usually making a lot of sweets here, but blueberry season is an exception for us. (So is apple pie with pecan crumb topping at Thanksgiving.) Somehow we manage to eat these (and sourdough starter pancakes) without going into a carb coma. But neither of us has diabetes. I wouldn't tempt any of my diabetic IRL friends with these. Even after cutting back the sugar. I don't know how other people like them so very sweet. They say in fruited muffins, you can cut sugar by as much as 50%. I also don't tend to eat a lot of sweet baked goods and regularly cut back by at least 50% and have not been bothered by it, especially when there's fruit in the baked item. And your muffins sound great, I will have to try them sometime! It sounds like I can definitely go down another 5-6% before I hit the 50% of flour weight point. Then maybe I'll experiment with going a bit under 50%, but staying well above 25% at first. Discovered just this week that with the right proportion of dates in (Rose Elliot) 100% ww scones, zero sugar is exactly the correct amount to put in the dough. Googled it and sure enough, there is such a thing as a Date Muffin. I love making muffins (and having them for breakfast), especially when different fruits are in season. Just made a batch of Strawberry Rhubarb muffins myself. :) One thing I like about them is that you can use whatever flour(s) you want because they don't need gluten. Given the number of flours I have (haven't counted lately, but probably more than 12), I often try different combination for muffins, including gluten-free flours like buckwheat or quinoa. As for the sugar - try using mashed banana or applesauce as part of the liquid and sugar (play around with the proportions). Or use ground dates. I find most American muffin recipes to be too sweet so I will often cut back on the sugar. Thanks for pointing out that muffins are a great vehicle for trying out new flours for the first time. I've got einkorn, emmer, and spelt berries in my cupboard just begging to be used for something! I like the idea of trying mashed banana or ground dates as sources of sugar, too.